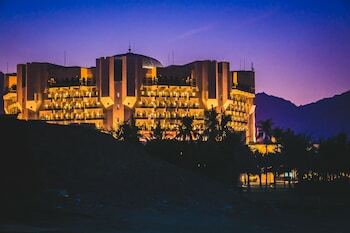 Located in Muscat, Al Bustan Palace, a Ritz-Carlton Hotel is by the sea, within a 10-minute drive of Marina Bandar Al Rowdha and National Museum of Oman. Featured amenities include a business center, limo/town car service, and complimentary newspapers in the lobby. Planning an event in Muscat? This resort has 8138 square feet (756 square meters) of space consisting of conference space and meeting rooms. Free valet parking is available onsite. With a stay at Beach Bay Hotel in Muscat (Shati Al Qurum), you'll be within a 10-minute drive of Oman Natural History Museum and Royal Opera House Muscat. Free self parking is available onsite.